Lockheed Martin has received a $331.8 million contract from the U.S. Army for Lot 11 production of Guided Multiple Launch Rocket System rockets. The contract calls for the production of GMLRS Alternative Warhead rockets, GMLRS Unitary rockets and Reduced-Range Practice Rockets for the U.S. Army, U.S. Marine Corps and for Foreign Military Sales to Israel, Finland, Jordan and Singapore. 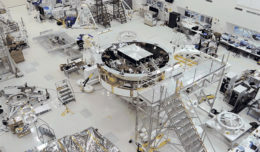 Work will be performed at the Lockheed Martin facilities in Camden, Ark., and Dallas, Texas. All production deliveries are anticipated to be completed by March 2018. In combat operations, each GMLRS rocket is packaged in an MLRS launch pod and is fired from the Lockheed Martin HIMARS or M270 family of launchers. GMLRS was established as an international cooperative program among the U.S., France, Germany, Italy and the United Kingdom. Other international customers include Japan, Bahrain, Finland, Israel, Jordan, Singapore and the United Arab Emirates.